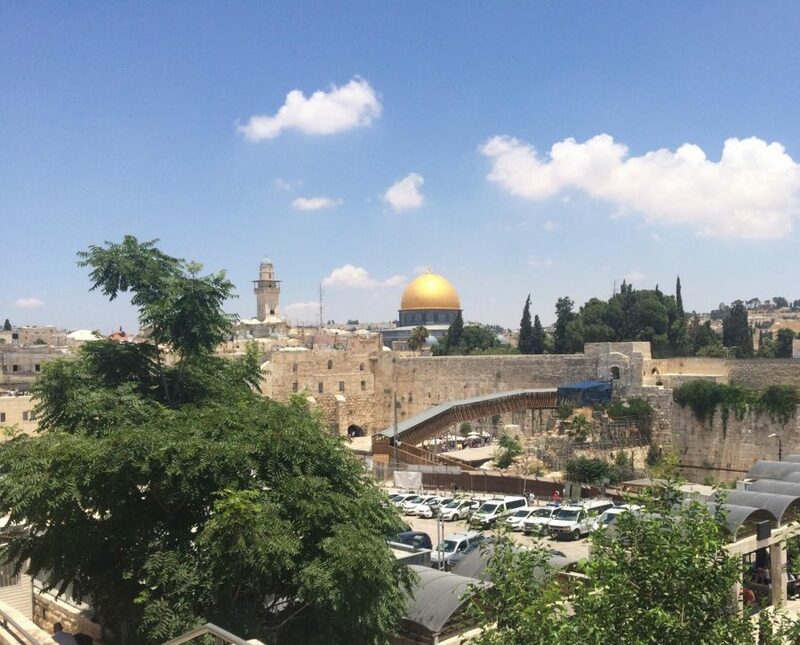 The Temple Mount, a holy site in Islam, above the Western Wall, the holiest place in Judaism. This image was taken in the Old City of Jerusalem. JERUSALEM, Israel– This past Monday, May 14th, heralded a new age in U.S.-Israel relations. With much pomp and circumstance, the United States officially moved their embassy in the Jewish State to Jerusalem, making the U.S. one of the first countries to officially recognize Jerusalem as Israel’s capital. The proud Jew and grandson of Holocaust survivors inside of me is elated by the news that the U.S. is finally recognizing Jerusalem as the capital of Israel. I have always known and believed Jerusalem to be the rightful capital of Israel, unlike the international convention which is to recognize nearby Tel Aviv as Israel’s capital because Palestinians claim Jerusalem is also their future capital. My liberal American side is convinced that this is not the right time to move the embassy to Jerusalem. I look at the recent strife in Israel and the Middle East, with the continuing protests in Gaza and the West Bank, plus the demise of the Iran Nuclear deal, and recognize that this will probably cause more harm than good in this day and age. And yet, if not now, when? There has never been a “good” time to move the embassy to Jerusalem, a law in the U.S. since 1995 that has been delayed by Presidential waiver for over two decades because of national security risk. There will always be a security risk by doing this and, at the rate the peace process is going, delaying the move of the embassy is not going to do anything. Regardless of what I believe, the U.S. recognition of Jerusalem as the capital of Israel has caused an immediate response by Islamic militant group Hamas in the Gaza strip. A little over 40 miles away and on the same day as the ceremony in Jerusalem, Israeli soldiers killed 60 protesters at the Gaza border, 50 of which were members of Hamas. Additionally, over 110 Palestinians have been killed in these ongoing protests since March 30th. The American part of me simply cannot condone the killing of unarmed protesters, even if the majority of these protesters are members of Hamas. Don’t take this as me supporting Hamas because, believe me, I absolutely do not support anything that organization does, but, I find it morally wrong to kill anyone who cannot fight back. However, some of me does recognize that Israel needs to defend its borders. Israel has strict policies on using live fire, or actual bullets, in situations like these. The Israeli Defense Force (IDF) has even has “rules of engagement” for military confrontations in areas with significant population. I believe that people running at the Israeli border does warrant a security risk and that Israel has a valid right to defend its borders. That still does not justify killing unarmed protesters. Yes, several of these protesters were armed and members of the militant wing of Hamas, yet all loss of life is bad in my mind. In all my years of Jewish learning, I have adopted many Jewish values and beliefs. One of these values I hold most dear is Pikuach Nefesh, or saving a life, an ideal held above almost all other ideals. Both my Jewish and American halves agree that the most essential thing to do going forward in the Israeli-Palestinian Conflict is to prevent further loss of life. I fully, 100 percent support Israel and absolutely believe that Jerusalem is the rightful capital of my people’s homeland. However, I simply cannot support an Israeli government, or a government of the U.S. for that matter, that permits the killing of unarmed people. I believe the only way to avoid further bloodshed and for the capital of Israel to be internationally recognized as Jerusalem is for both the Palestinians and Israelis to compromise and negotiate a permanent truce where each party has its own country and can coexist peacefully.